Women’s football has seen a boost in recent years. Marked by increasing attendances year on year and the undoubtedly positive effect on the sport brought on by England women’s World Cup exploits earlier this month, the 2015 SSE Women’s FA Cup final takes place at Wembley Stadium – for the first time in the competition’s history. The final sees Women’s Super League (WSL) leaders Chelsea Ladies take on third placed Notts County Ladies and while the match is already a showcase for some of the league’s top talent, it is also expected to feature Lionesses Katie Chapman (Chelsea), Eniola Aluko (Chelsea), Laura Bassett (Notts County) and Ellen White (Notts County), who have all just returned from England’s 1-0 World Cup third place playoff victory over Germany in Canada. With prize money of £5,000 for the winners and £2,000 for the runners-up at stake, the financial incentives might not yet be comparable to the competition’s counterpart for men, but an ever growing crowd, live broadcast of the match on BBC One and of course this year’s venue bear witness of how far women’s football has come in recent years. 15,000 spectators watched last year’s final at Stadiummk in Milton Keynes – and the organisers will be hoping for a far higher number of sold tickets when the competition climaxes on England’s biggest stage. It is hard to believe that Notts County are competing in just their second WSL season so far. After a disappointing sixth place in their inaugural campaign in 2014, the team managed by Rick Passmoor have been steadily improving and although they are currently in fourth place, they are only one point from a Champions League spot with just two league defeats so far and further find themselves in the FA Cup final having beaten last year’s finalists Everton 3-0 in the semi-finals. Rachel Williams jointly leads the league’s goalscoring chart, with four goals to her name, while Ellen White has hit the back of the net three times in six games and has scored three in Notts County’s three FA Cup matches. However, Chelsea will be eager to leave the pitch as FA Cup winners this year. After losing their first FA Cup final against Birmingham on penalties in 2012, the London club beat holders Arsenal in the quarter-finals and Manchester City in the semi-finals, while they have conceded just one goal in the competition so far. Emma Hayes’ team top the league and are yet to lose this season, with Gemma Davison the team’s leading league goalscorer (four in the league, two in the cup) and Marija Banusic netting three times in the cup competition. The two clubs last met each other in a WSL game in March when Chelsea beat Notts County by one goal. Unlike many stadiums in the world, Wembley Stadium doesn’t require much of an introduction. The iconic 90,000 seater venue is the second largest stadium in Europe after Barcelona’s Camp Nou. Known for its 134 metre high arch, the rebuilt stadium, which is owned by the Football Association, was opened in 2007 after its predecessor was demolished after 78 years of service. It is located in north-west London. 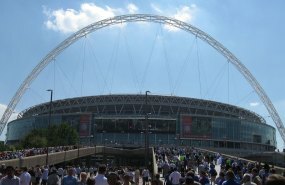 For those travelling by train or tube, Wembley Stadium is conveniently located on the Chiltern railway line as well as the Bakerloo and Overground Lines, while it is in walking distance from Wembley Park Station (Jubilee and Metropolitan Line). In addition, the bus lines 18, 83, 92 and 224 stop at the stadium, with the National Express providing a dedicated coach service for people traveling from further afield. Whilst parking spaces are available, these tend to be limited and it is recommended to book in advance if travelling by car. Located a stone’s throw from Buckingham Palace, Holiday Inn London Mayfair is in the heart of England’s capital amidst the city’s largest concentration of five star hotels. The luxurious district is well known for its exclusive shops, while the hotel’s guests are also within walking distance of the famous Hyde Park, St James’s Park, 10 Downing Street and Westminster. If you travel by train into London, the Holiday Inn London Bloomsbury might be more convenient however due to its proximity to Euston Station and St Pancras, while the British Museum is also nearby. For visitors keen to soak up even more knowledge, the Holiday Inn London Kensington Forum is ideal for trips to the Natural History Museum, the Science Museum and Victoria and Albert Museum as well as the Kensington Palace and Royal Albert Hall, while the Holiday Inn London Regents Park is situated next to Regent’s Park, which boasts London Zoo with 755 species of animals, beautiful gardens and plenty of outside activities for sports fans. For those wishing to stay closer to Wembley Stadium, the Holiday Inn London Brent Cross with its 12 minute car journey from the venue is ideal. In addition to obvious sights like Buckingham Palace, Westminster Abbey, the Houses of Parliament, the Tower Bridge and the Tower of London amongst many others, football fans visiting London should take advantage of the 13 professional teams that reside in the United Kingdom’s capital. Although the start of the season is still a few weeks away, stadium tours are available at most clubs, while some even have a dedicated museum and organise tours with club legends. Written in collaboration with IHG.